There is something to be said for ringing out the old and bringing in the new as the years change. and let them move on to new homes in 2013. Today (Jan 7, 2013) I put up my vintage 1972 Blythe doll up for auction, so she could find a new home; and if she is a lucky girl, get restored into a the shining beauty she can be. I think my old girl's got a lot of potential! 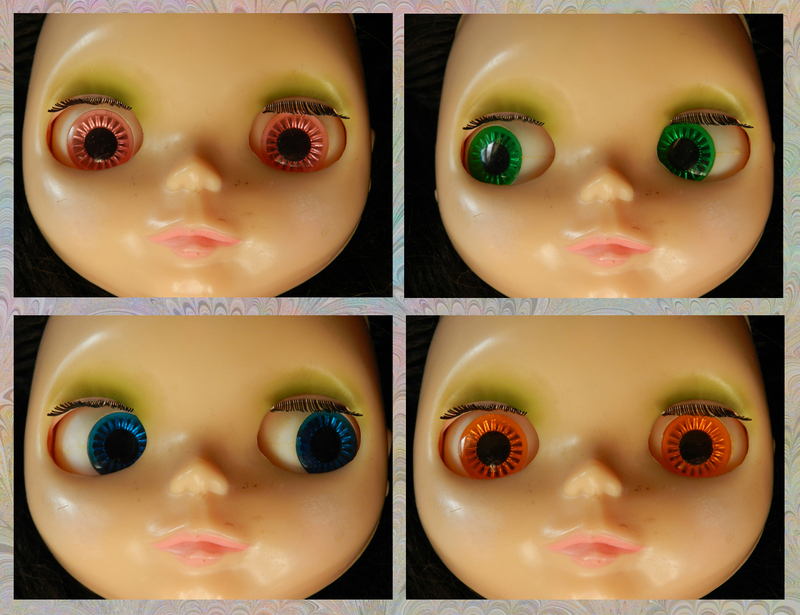 My Vintage 1972 Blythe Doll and close ups of the 4 colors of eyes she has when you pull her string. 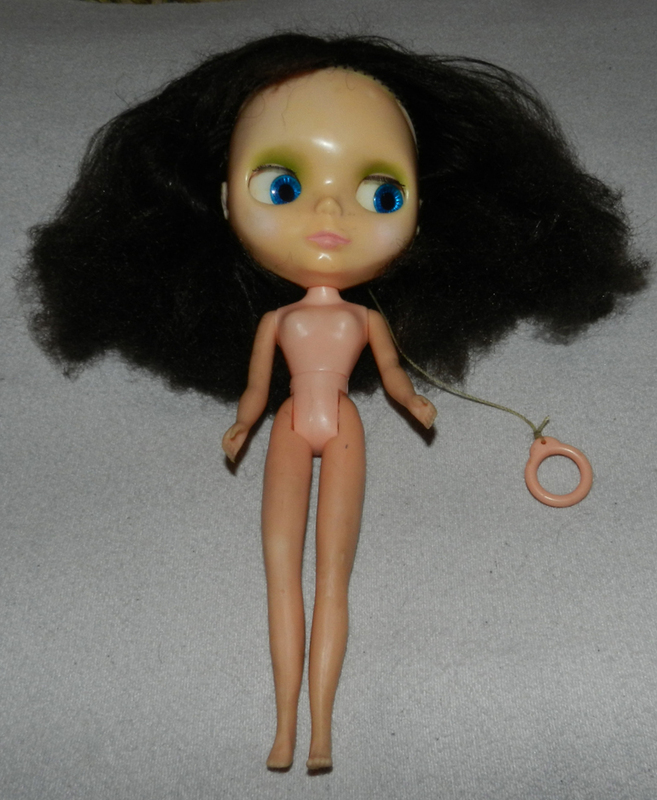 The Original Blythe doll made by Kenner in 1972 only had short lifespan of that one production year. Many girls found her big head and eyes "spooky" and so she was pulled from production due to low sales and customer feedback. I have to admit, I was one of those girls. I wanted and this odd doll stared back at me from her box. I really thought Santa had a warped sense of humor or... was I on the Naughty List? 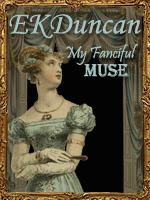 pulled back into a ponytail and her pink eyes were starring straight at me from her box. So imagine the image of the "center" doll, giving you the eye from her box. Not exactly what a 7 year old wanted to see on Christmas day at all. my niece told me she was glad it was leaving the city for good, since it gave her the "creeps". "Medieval Mood" Blythe looked like - back in the day before being outcast in my doll chest. Bless her plastic heart she was/is in dire need of a stylist to bring out her "cute" side. 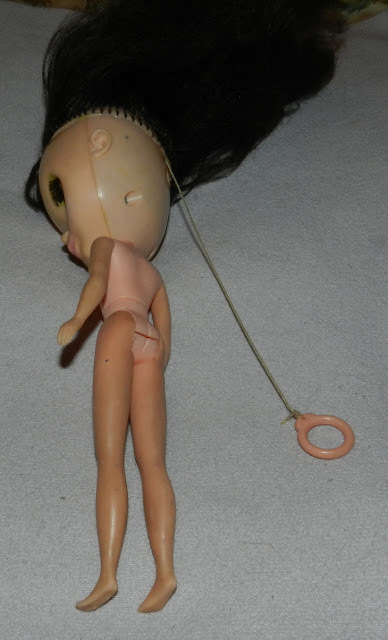 I tried to play with her back in the 70's but she could not wear Barbie's clothes they were all too big so she just ended up in the bottom of the toy chest for the duration of my childhood and then got packed into the attic with all my other dolls years ago. Sadly several decades in an attic trunk did not allow her to remain young and fresh as you can imagine, so she is in need of some TLC and a new wardrobe to become all she can be. 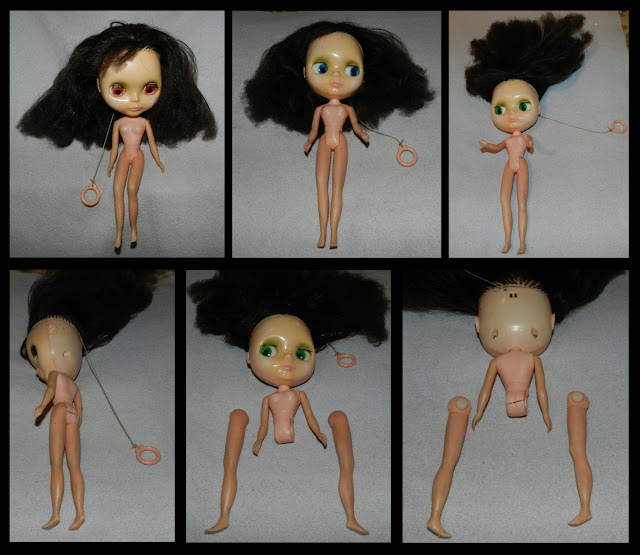 Here are some more detailed images showing the current condition of my 1972 Blythe. I believe she was originally marketed to have Purple, Green, Blue and Amber Eyes. but in 1972 Hong Kong they gave her Pink instead of Purple and Orange instead of Amber. along the marketing being written and color selection things got changed? Either way Blythe is an unusual doll due to this ability to chance eye color with the pull of a string. Even her modern counterpart being made in Japan by Takara has this signature feature. As you can see from this shots, she is not a mint condition doll. She has some issues but in her favor she has all her original parts, including the string and pull ring. Her pull string and ring are intact and work great. All the eyes click into place easily. (Blue, Orange, Green, Pink). 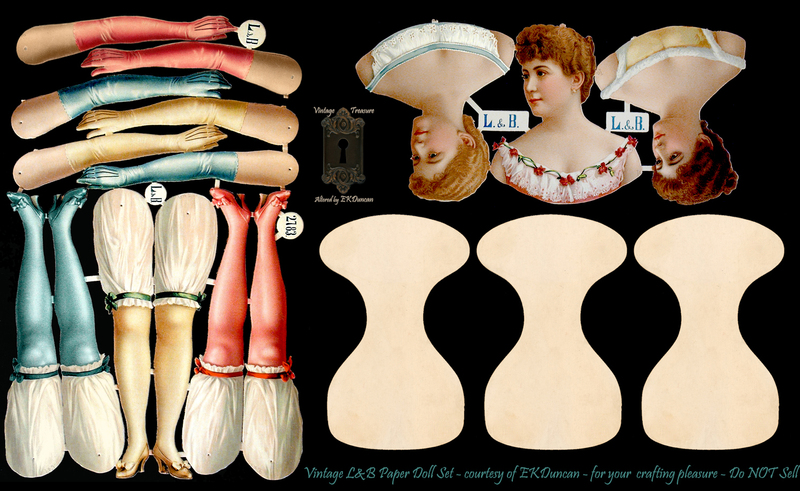 The "whites" of her eyes are pretty white with some yellowing around the seam lines. The color chips for her eyes are bright, and clear. Her eyelashes appear to all be there. She still has her green eye shadow & pink lips but her cheeks seem to be "worn or rubbed" off. Her knees bend and she can hold a seated pose. 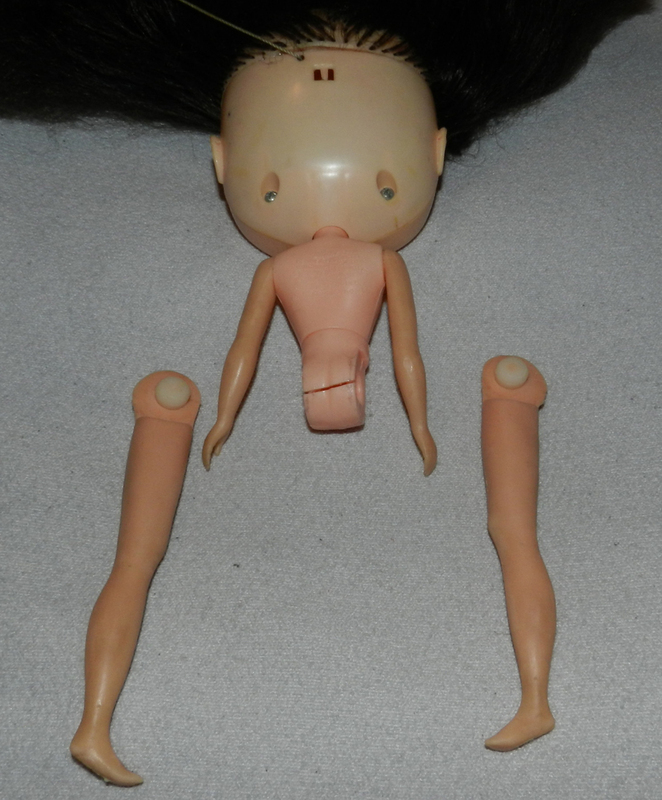 Her legs are intact and don't have any breaks in the "skin" but there are some discolored spots here and there. She seems to have all her hair plugs intact; though her hair is very frizzy and need of attention. original 1972 Blythe for their collections is the fact that she has bendable legs. this is probably due to the fact that she was not "played" with very often. It's interesting how your perception of things changes with age. When I was 7, I found her pink eyes disturbing but 40 years later they are kinda cool. Pink Eyes on 1972 Blythe with dark hare and her bangs pulled off her face. This is a good close up on her face showing some marks and scratches on her face. 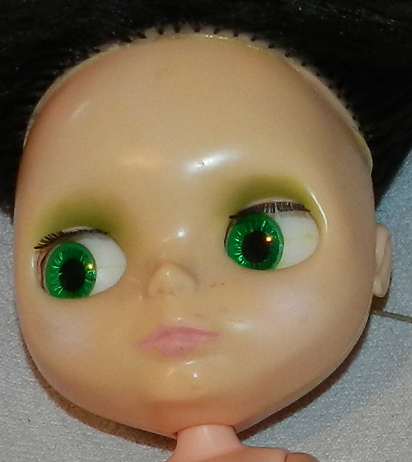 Her face has "yellowed" a bit over the years and her cheek color has "worn" off. The new trend seems to be to give Blythe a matte face rather than leaving her face shiny a she was originally made, so this doll would be a good candidate for the modern "facial"
of several sandings and buffings to acquire that look. 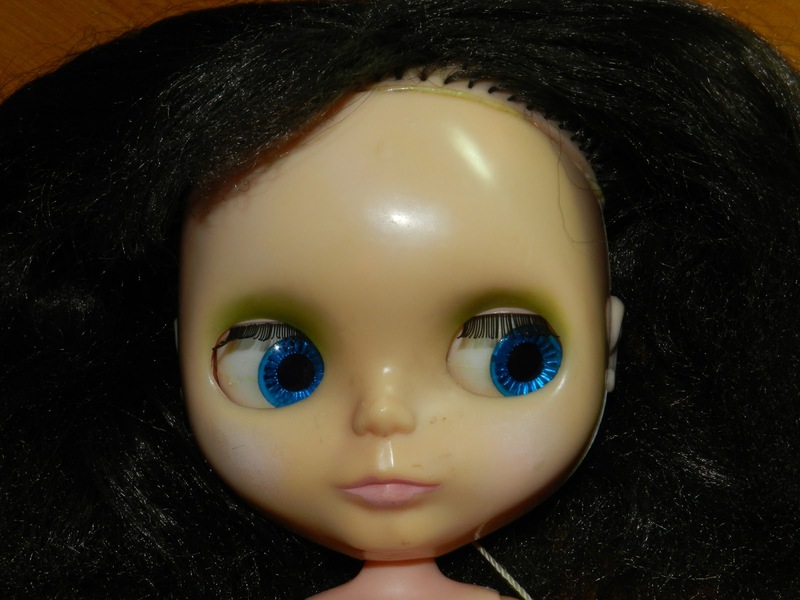 I've got Blythe's bangs pulled off her face so the scalp hair seem can be seen. 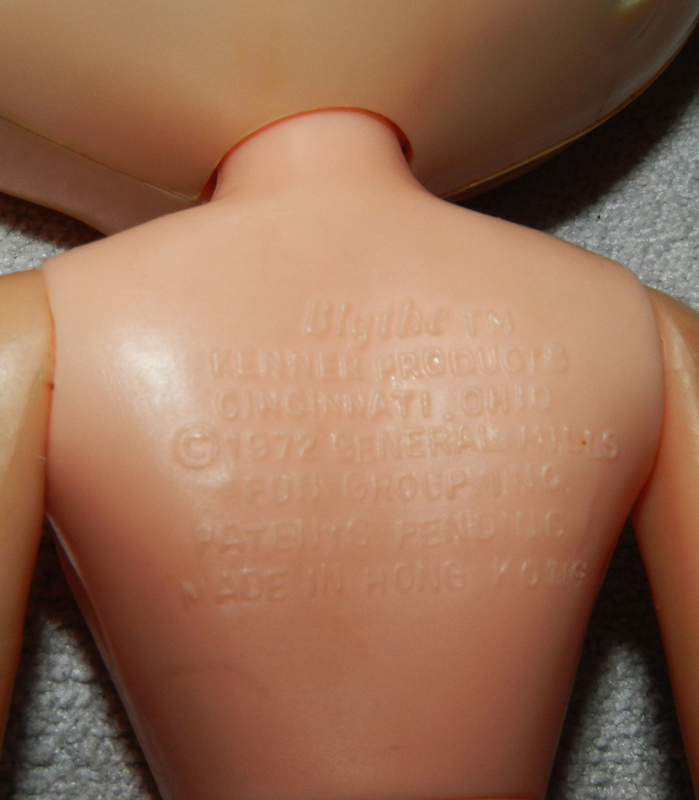 As typical with most 1972 Blythe dolls there is a bit of glue visible. get wet, they won't fall off. 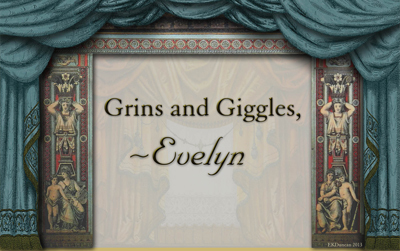 I did not test the theory - grins. I love the way Blythe's eyes slant off to the side for the Blue and Green color choice. The "white" of her eyes are still fairly white but there is a bit of yellowing in spots, particularly at the mid part of each eye where there is a seam. This is probably due to the aging of the glue or whatever bonding agent they used in the factory while assembling the eyes. 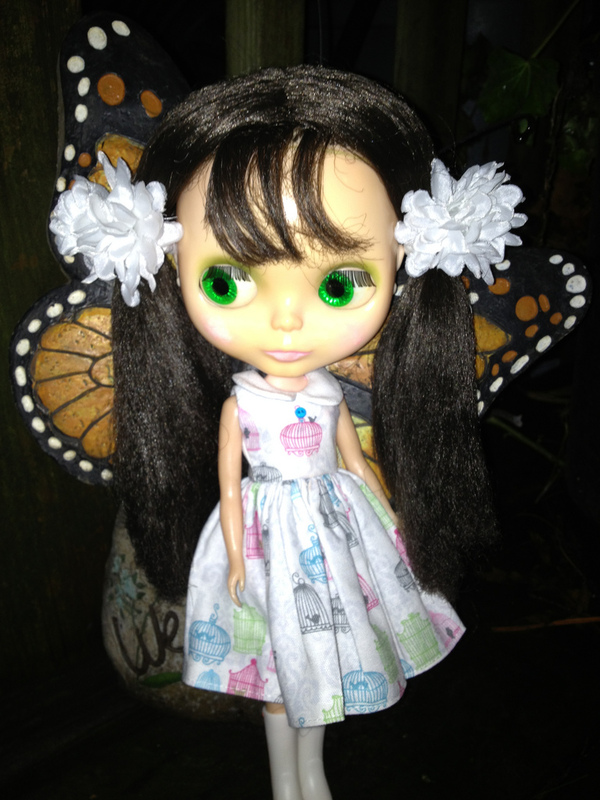 Well my Blythe still has a head full of hair but it's frizzy and in need of attention. so I'll leave the process of taming her mane to her new owner. Not a very dignified pose but it does show her intact and original pull string/ring combo. 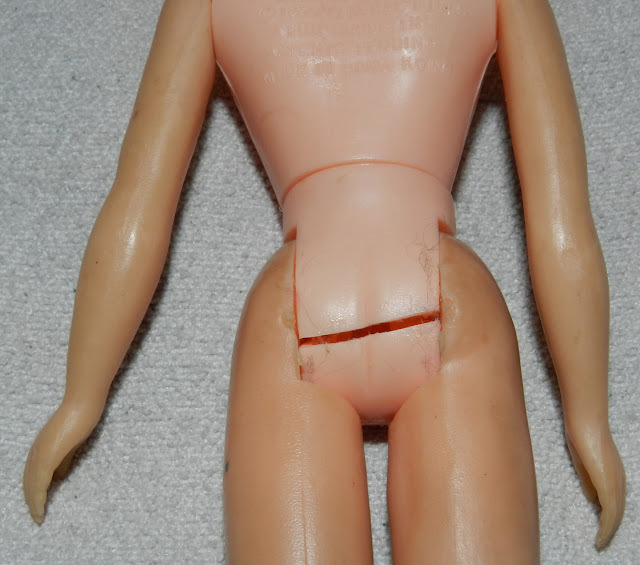 It also lets yo see some of the marks on her legs as well as the "cracked" plastic at her bottom. My guess is this occurred while she was in the attic trunk. residue removal in case I used the wrong method and caused her additional damage. This shot shows the pull string coming out the back of her head, the cracked bottom and the inside view of both legs. Even with a cracked bottom she holds onto her legs pretty well but I'm sure her new owner will know how to fix her so it's never an issue again. 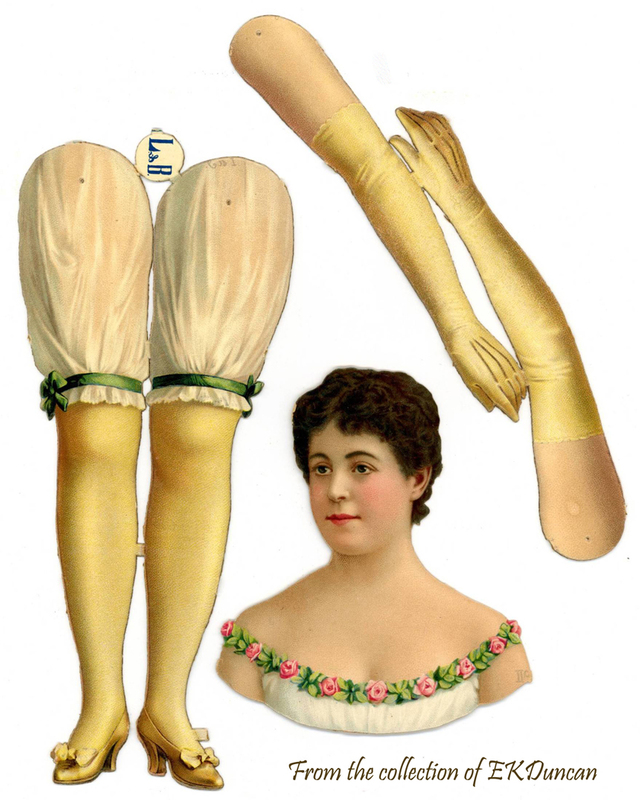 It appears several different runs were made of this doll in her short production span. My doll happens to have 7 lines of text on her. which is most likely seeing as I got her in Dec 1972. The best I can tell - My Blythe seems to be a center part brunette with bangs. Her hair is very dark brown but not quite black in color. I believe they made some dolls with wispy and others with chunky bangs and I believe mine to be of the "wispy" variety since she only seems to have a small amount of bangs and they don't go all the way across the front. My vintage Blythe Doll has a new home and has received her first "spa" treatment! She looks so cute all dolled up for her first appearance as Charlotte. Charlotte's owner has a wonderful collection of Blythe dolls, so I hope you check out her Flickr album and see all of Charlotte's new friends. Charlotte - A new home and new look for my childhood doll - isn't she cute! the beauties others have created using vintage and modern versions of Blythe. 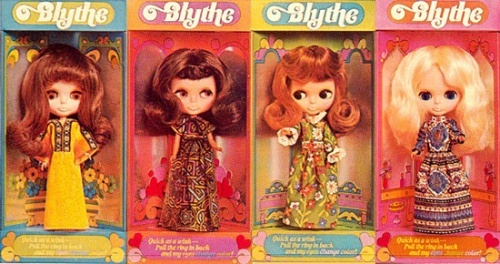 some with bangs, others without but they all suffered the fate of extinction back in 1972.
and Blythe has quite a large following and fan base across the globe. Blythe is a popular doll in Japan; she has many looks and comes in a variety of hair colors. There is even a line of haircolor so you can match yours to your dolls. 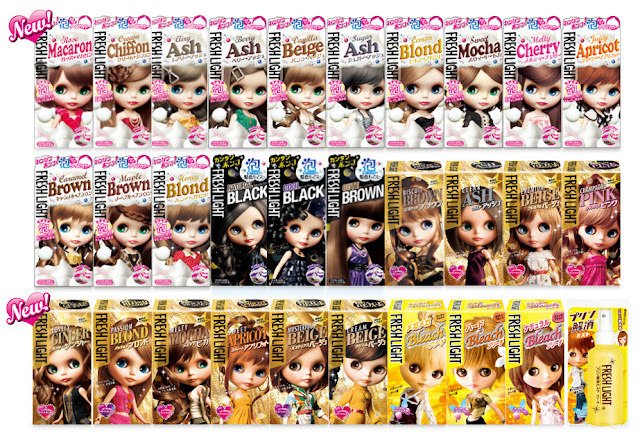 This is not dye for dolls, it's for humans but Blythe dolls show you the color you will get. 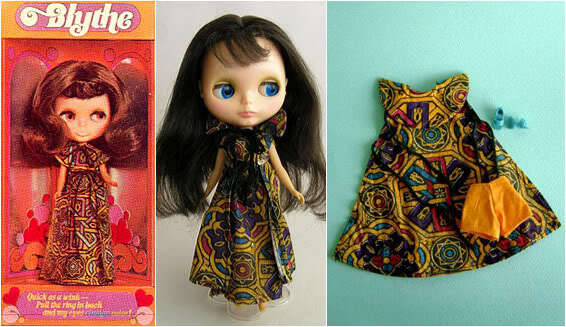 1972 Blythe dolls and her more modern counterpart. 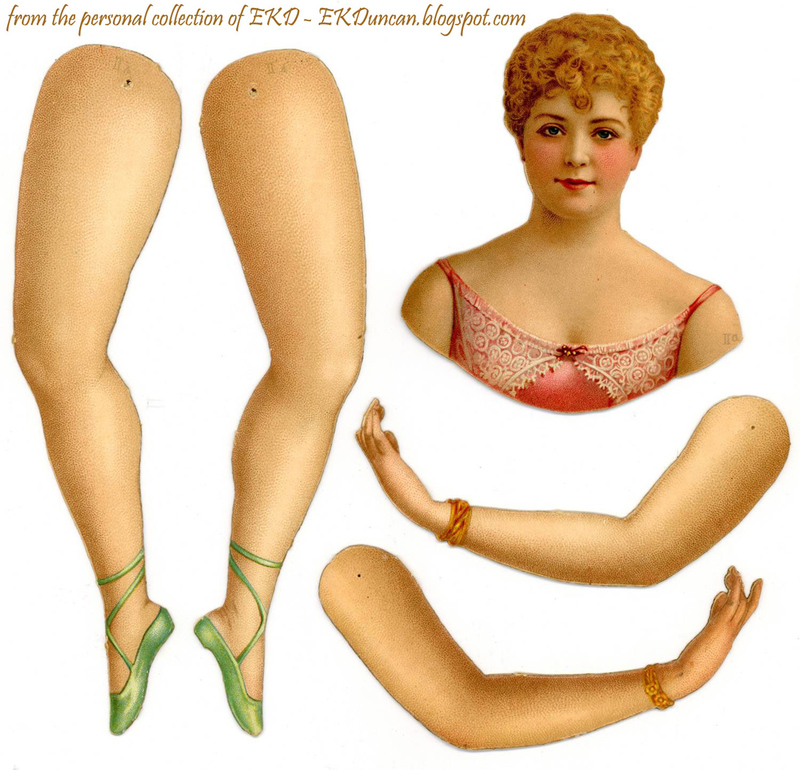 don't expect to find them inexpensively; these dolls retail for hundreds of dollars. 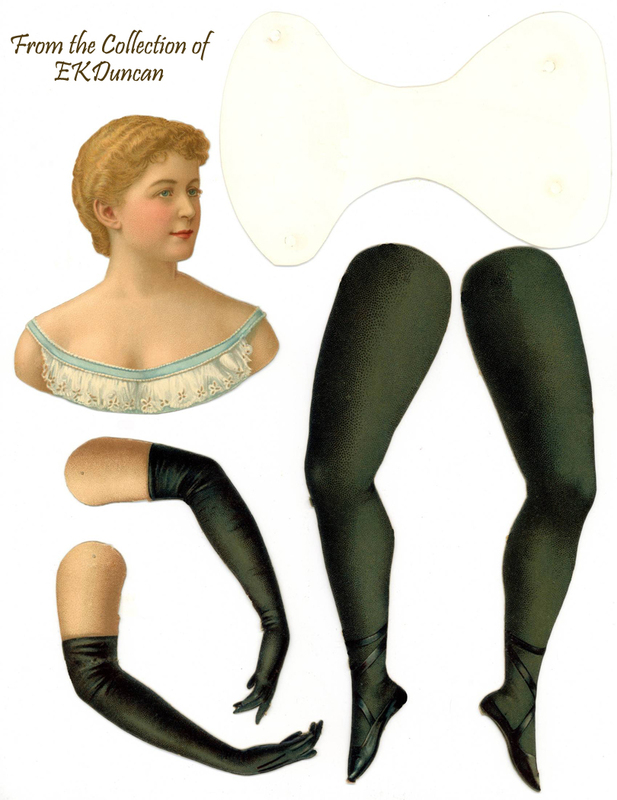 many doll artists and stylists create using both vintage and modern versions of Blythe. 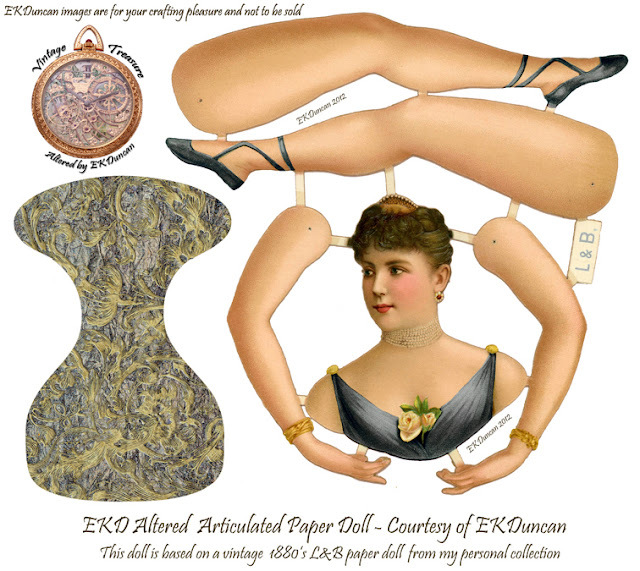 Her doll creations are one of a kind art pieces. 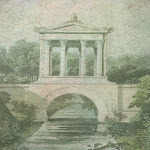 by a variety of scenery accessories. All of them are stunning! This sampling of "Special" Blythe Doll Creations are by Cookie Dolls. amazing creations artists are doing using Blythe dolls. 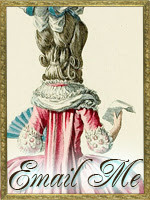 Please visit Rebeca Cano's - Cookie Dolls blog - HERE to see more. Naturally there are many more talented artists creating special one of a kind Blythe originals. If these examples tickle your interest you might want to browse the web to see what other intriguing beauties have been created. 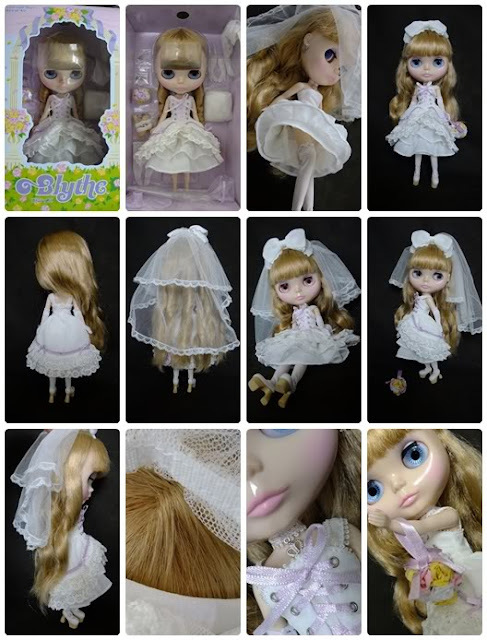 OK so basically Blythe is not your typical "little girls" doll; however if restored and "dressed" right she can be a very cute doll or dramatically stunning as in the Cookie Doll creations by Rebeca Cano, seen in the above photo. I've seen many nice examples of what Blythe enthusiast create; which is why I chose to put my "in need of TLC" 1972 Original Blythe Doll on the market. My hope is she will finally be turned into a "jewel" herself. And here she is once again - My Vintage Blythe now has a new home and new look. Patty - thanks for giving her a great new home. Thanks for letting her come and live with me!!! Hey Patty!!! - I'm amazed at the improvement in her and you've only had her one day. I debated for weeks about trying to restore her but in the end was too afraid to try. Original Blythe's are just to precious to risk ruining; especially when so many Blythe enthusiasts would like one in their collection. I know I made the right decision on letting her go, after seeing the way she currently looks. Thanks for seeing her potential and starting her on the road to being all she can be. And a special thanks for sending me a photo and sharing your Flickr posts so I can see her and your wonderful collection. Strange little doll and I did not know when I was young, because I was born at the same time as the Barbie doll. On the Etsy site you can also find these dolls, you can even find small clothing made exclusively for them, it's so cute!!! Hey Sylvie - Yes, she seems to have a nice size following and there are many websites dedicated to her, both the modern and the original 1972 version. 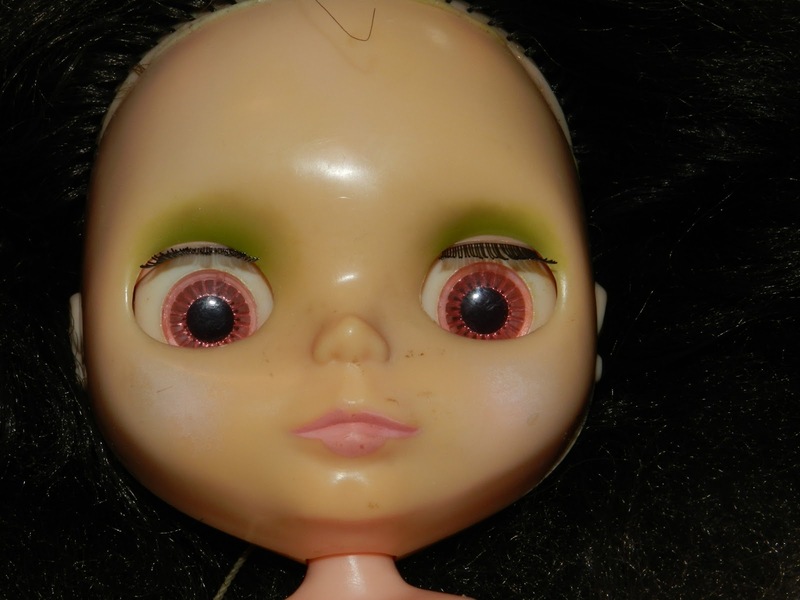 eBay and Etsy have many "add on" items that can be purchased to alter a Blythe doll. You can even change her hair and eyes for "custom" versions. 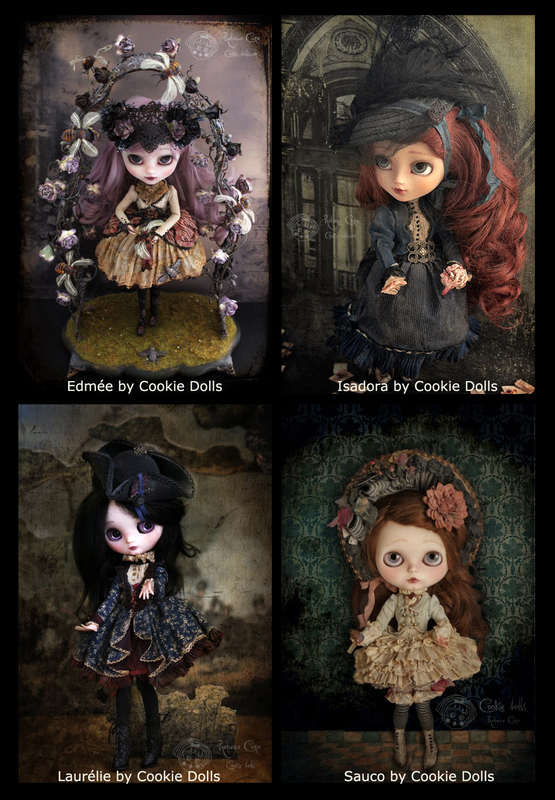 I would not be surprised if the modern Blythe dolls started showing up in USA stores in the next few years. It will be interesting to see if that happens. 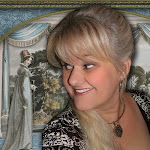 Hey Patti - I had success with selling my childhood doll on eBay. I hope you find a good home for yours as well.